Review by Karen Topham, American Theatre Critics Association member; photo by Charles Osgood. No, Jeremy Wechsler is not clairvoyant. The artistic director of Theater Wit obviously had no idea of the impending college admissions scandal when he chose Joshua Harmon’s scathing satire Admissions for his spring slot. But the scandal involving celebrities Felicity Huffman and Lori Loughlin has underscored the brilliance and timeliness of Harmon’s powerful script and made the choice seem utterly prescient. Admissions is a provocative, funny, whip-smart play aimed unabashedly at white liberal society and highlighting much of its hypocrisy. We are introduced to Bill and Sherri Mason, headmaster and admissions director of a second-tier prep school in New Hampshire who have, since their arrival, been striving to put their school on the map. To do this, Sherri (Meighan Gerachis) has been concentrating all of her efforts into raising the appallingly low 6% minority level to something more acceptable, and she has succeeded, through scouring the country and even the world for suitable candidates, to get it up to 18%—which she still considers too low. Her focus is so complete that she even micromanages her secretary’s (Judi Schindler) work in putting together the annual school catalogue: there are not enough black faces in the photos, she insists, and the ones that are there don’t “read” black. She wants minorities looking at the catalogue to feel that Hillcrest is a school they’d feel comfortable attending. Driving the point home is Sherri’s best friend Ginnie (India Whiteside), who has seen from the inside how the world is unfair toward her black husband and can’t believe her friends could feel for an instant that her son got into Yale just because of race. Whiteside, who has one of the play’s best reactions when she finds out that he was accepted, shows palpable disgust that her hyper-liberal friends could harbor such thoughts, and this triggers the obvious white guilt that follows, as Sherri tries in vain to fix things. Though Walker also has some wonderful and powerful moments, especially in exchanges with Curry, the play really belongs to Curry and Gerachis. Wechsler gives Curry a very long leash during his rave-out and the young actor takes advantage of it, making us simultaneously laugh and cringe. Apparently this long rant shakes up the character as well, for Charlie later tries to make things right (though his solution, which propels the last half hour of the play) is equally extreme. As for Gerachis, Sherri’s frustration as a mom and as an admissions officer who knows the score is easy to see. Though her part has no standout speeches, she is the center of this play’s moral quandary and the embodiment of the hypocritical confusion that well-meaning liberals sometimes find themselves in: understanding the need for change but feeling trapped when it applies to her. She is the play’s flawed soul, and through her we wring out our own guilt at the privileges we enjoy. Wechsler plays all of this out on a nifty set designed by José Manuel Diaz-Soto which is part family home and part Admissions Office, helped out by Jessica Neill’s lighting and Tony Bruno’s original music and sound. The set quite literally pulls Sherri’s office into the living room of her house, bringing the play’s issues even more to the forefront: she cannot escape the effect that decisions such as she has made have on families like her own. But this is not a play that pulls punches: Harmon’s script puts everything on the table, and he is absolutely unafraid to rake his own over the coals. Like the current scandal in the real world, Admissions trades on the notion of white privilege and asks what the limits are for how parents help their children in matters like this. Ultimately, we are asked to examine our own truths on this issue, and the play, which posits a “perfect” solution and quickly shoots it down as impractical, suggests strongly that we will come up wanting. And if it hits a bit too close to home, so be it: that is clearly what Harmon and Wechsler are going for. 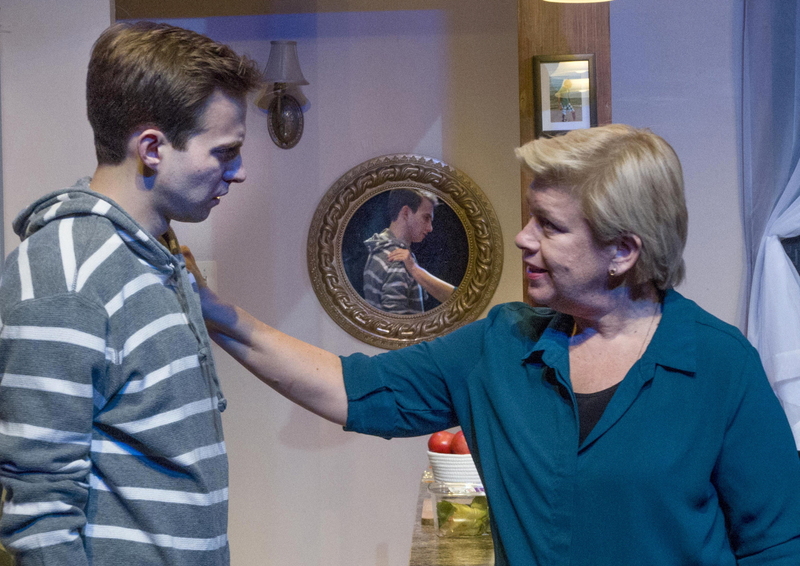 Admissions is now playing at Theater Wit, 1229 W Belmont, Chicago, through May 12. Check the website for specific dates, times, and tickets. Find more information about current plays in our front page recs and attheatreinchicago.com.